The catalogue to accompany the exhibition Printed in Norfolk is now on sale from Cornerhouse Books. It contains essays by Coracle director, Simon Cutts, writer, poet and performer John Bevis and by Andrew Wilson, Curator, Modern and Contemporary British Art, Tate Britain. It is designed by Colin Sackett and published by RGAP. Click here to buy Coracle publications from Cornerhouse Books. Click here to buy RGAP publications from Cornerhouse Books. Site Gallery has recently started selling artists’ books from its online shop. 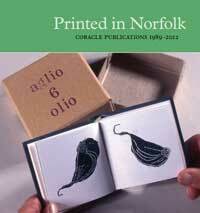 The Printed in Norfolk calalogue is available alongside works by John Dilnot, COPY, A Closed Caption and others. Click here to buy books by Printed in Norfolk catalogue designer and long-term Coracle collaborator Colin Sackett.